This set of 27 cards, geared for all ages gives a huge amount of information on each book of the New Testament from the New American Standard Bible. All of that info on a double sided, heavy card stock, 5 by 9 inch card. Memorizing Bible Verses, Books of the Bible, and key concepts can be hard for kids. These cards make it so much easier to keep all of this handy information in one place. Wizzy Gizmo gives suggestions on how to use these cards, based on age level. You can see those HERE by scrolling down. One way I found to use them for my 6 year old is by teaching the books of the Bible. I started small, with just a few. I mixed them up and then had him put them in the right order. Simple enough. Well take all 27 and shuffle them and time your older kids to see how long it takes them to put them in the correct order. We also took a look at one book per week beginning with Matthew. We would read through the information, different aspects each day at the start of our school day. We would do a quick review the next day of what we learned. We chose a key verse to work on memorizing from that book each week. Another idea is to use that verse for your handwriting assignment as well! What a way to incorporate the Word into our school day, just a little bit at a time. The consistency pays off. When we are done with the stack we will have a host of information on the Bible. This information will make it easier for us to find key scriptures, or specific things in the Bible we want to share with others, or even for our own indepth study. 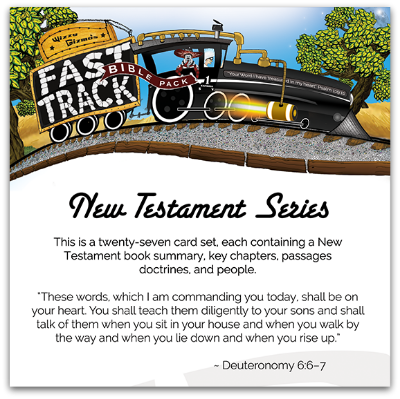 I would really love to see the Fast Track Bible Pack come out in Old Testament as well. Think of it as 'cheat sheets' for learning the basics of the Bible. Now nothing replaces the Bible at all, the Word is living and active. These cards really just help gather all of the information and facts together in such a beautiful way. I don't mind the New American Standard Bible, but it would also be nice to have a choice in Bible version. Perhaps that would be something they would consider later. Primarily for the key scriptures and memorizing them. This card set has been fantastic for the teacher as well! I have learned so much just in the review time we have had. I plan on keeping this momentum going and getting through the entire set. See what the Crew thought of other Wizzy Gizmo products by clicking on the banner below!